Applications are invited for appointment of Guest Faculty in the Department of Biophysics, Panjab University, for the Academic Session 2018-19.
i. 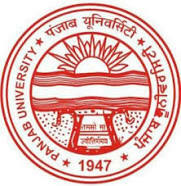 Good academic record as defined by the concerned University with at least 55% marks (50% marks for SC/ST/Physically & Visually Handicapped) or an equivalent grade in a point scale wherever grading system is followed at the Master's degree level from an Indian University or an equivalent degree from an accredited foreign University in the discipline of Biophysics and allied areas. ii. Besides fulfilling the above qualifications, the candidate must have cleared the National Eligibility Test (NET) conducted by the UGC and/or must fulfill the other UGC regulations for recruitment and appoint of Assistant Professor or equivalent positions in the Universities/Colleges/Institutions. The above assignment is on lecture basis with a token honorarium of Rs.1000/- per lecture with an upper limit of Rs.25,000/- per month. The candidate shall have to undertake that he/she will not draw any fellowship/stipend or any financial assistance from any agency and will do the same till they are teaching in the Department of Biophysics as a Guest Faculty. The details regarding interview date will be intimated later on through email.